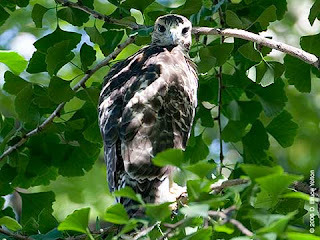 I found this great photo of a young hawk in a Ginkgo tree here. * Added YouTube video about the spermatozoid of Ginkgo biloba. * Added topic: Video: Juliette - Hiding Ginkgo nuts. * Added topic: Ginkgo does not interfere with drug absorption. 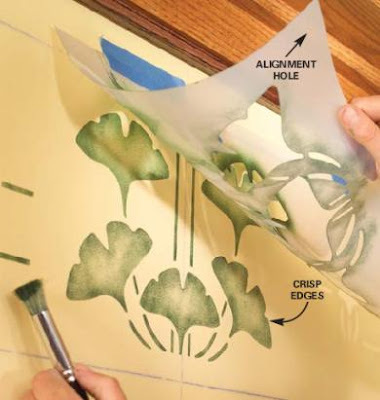 If you can handle a paint brush and a tape measure, you can quickly master the techniques for applying an attractive, simple border of Ginkgo leaves. * Added fossil photo from David Scarboro: Permian/Triassic (Karoo Basin of South Africa). * Added topic: Paintings by Tom Phelan. * Added topic: Video: a Ginkgo sonnet.